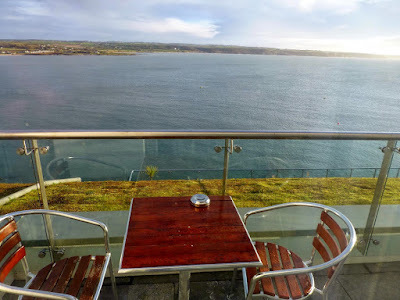 I’ve been very lucky this past few years to have dined in some well placed restaurants and cafes, places from Cork to Donegal that have a dining room with a view over water. 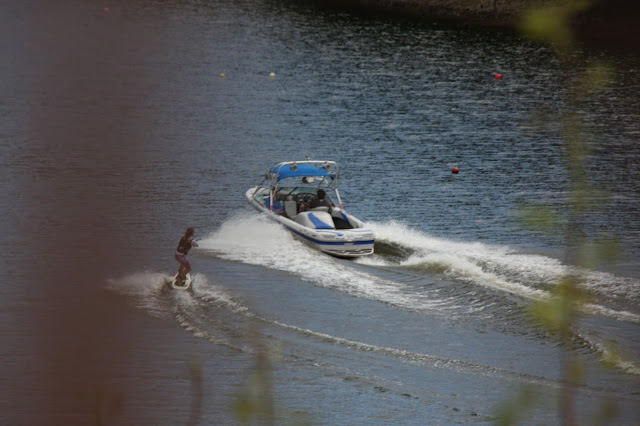 Sometimes over a river, maybe over an estuary, over a lake perhaps, and then sometimes over the ocean. 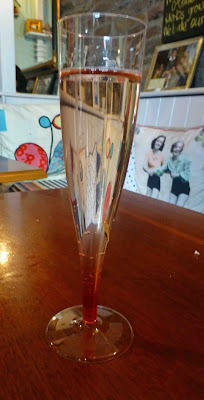 I was lucky too to have brilliant weather in most of the places. 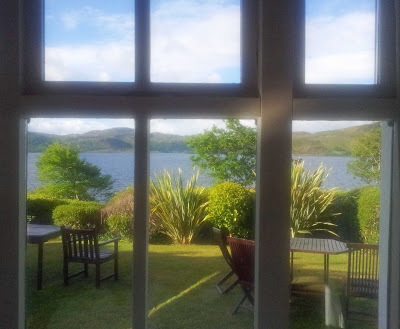 Caragh Lake is in Kerry, not too far from Killorglin, and you have great views over its waters when you dine in the splendid Carrig Country House. 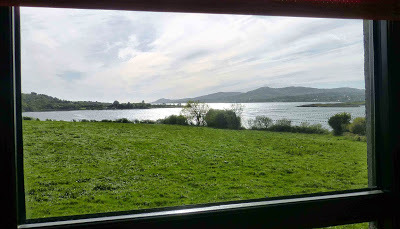 There are some similarities between Carrig House and the lovely Screebe House in Connemara; great food and great views. 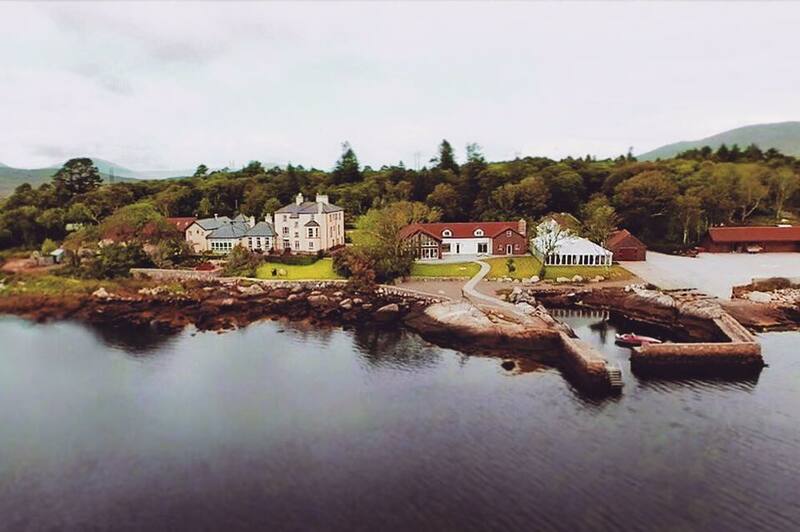 And in West Cork, near Durrus, there is Blairscove House. Here you can enjoy a splendid dinner and views over Dunmanus Bay. 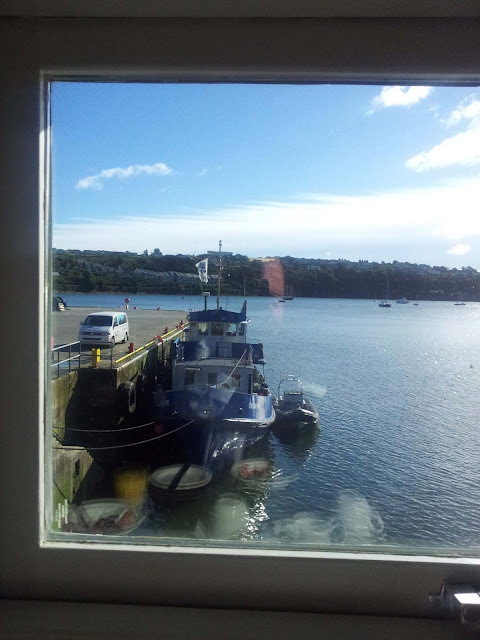 There are no shortages of views in Kinsale. 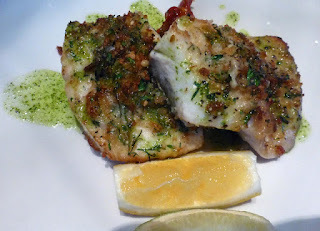 One of my most recent visits was to Man Friday on the hills above the bay Man Friday. And another recent visit was to the Trident Hotel, right in the town and so close to the waters that you think a boat is going to come through the dining room windows. 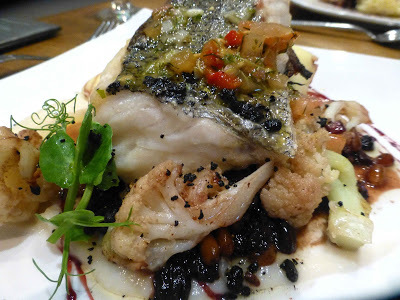 The Samphire at the Garryvoe Hotel has expansive views of Ballycotton Bay and the lighthouse, excellent food too. 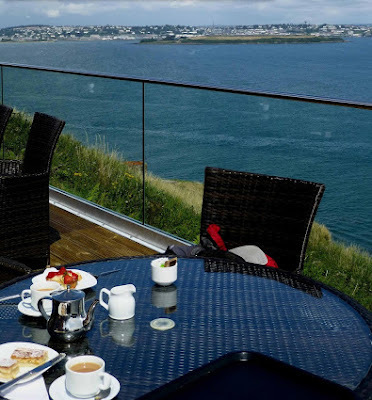 And across the bay, its sister hotel, the Bayview has an even more spectacular cliff-top situation. The views at Rosscarberry’s Celtic Ross, where French chef Alex Petit maintains a high standard, are quieter but no less pleasant. 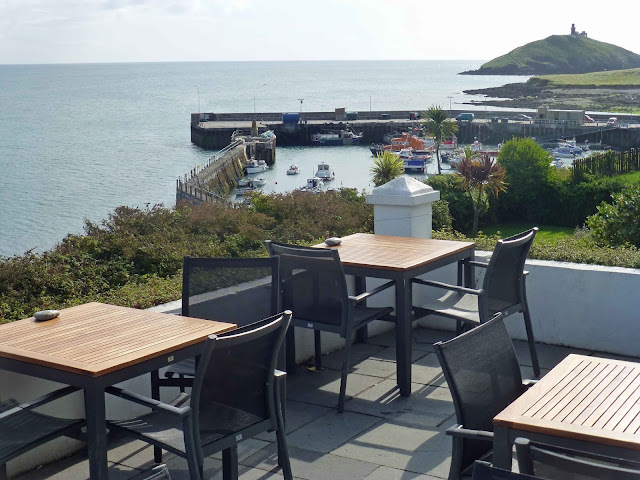 Ardmore’s Cliff House is renowned for the food, the views over the bay and their 3-word tweets! 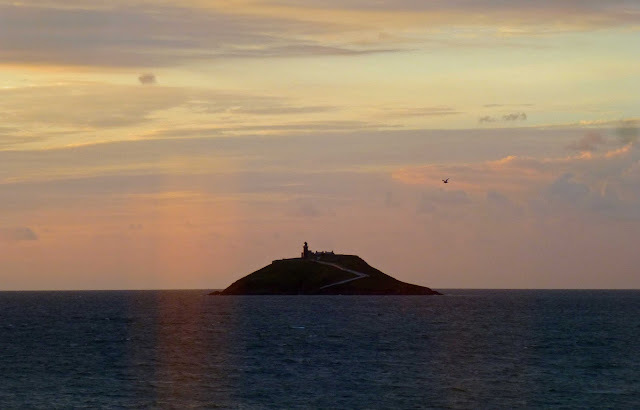 Back again to Ballycotton and to Pier 26. 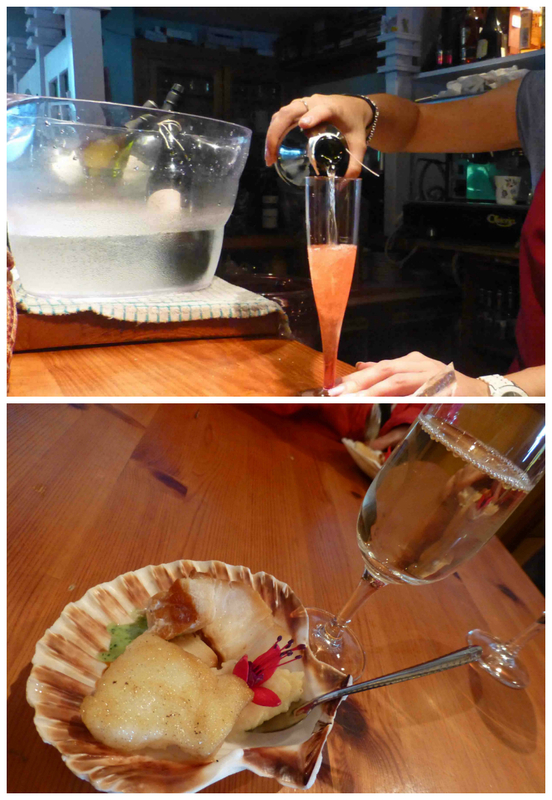 This restaurant overlooks the harbour and the lighthouse island and the fish is highly recommended, of course! 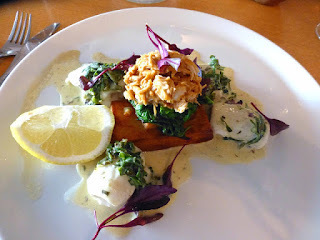 And down in Schull, L'Escale is right in the harbour area; the lobster here is a must try. 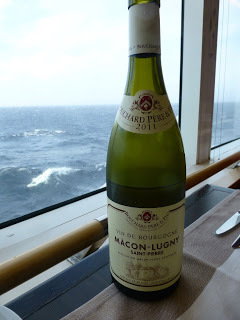 And if you really want a 360 degree ocean view while dining then take a trip from Ringaskiddy in Cork to Roscoff in Brittany on board the Pont Aven. 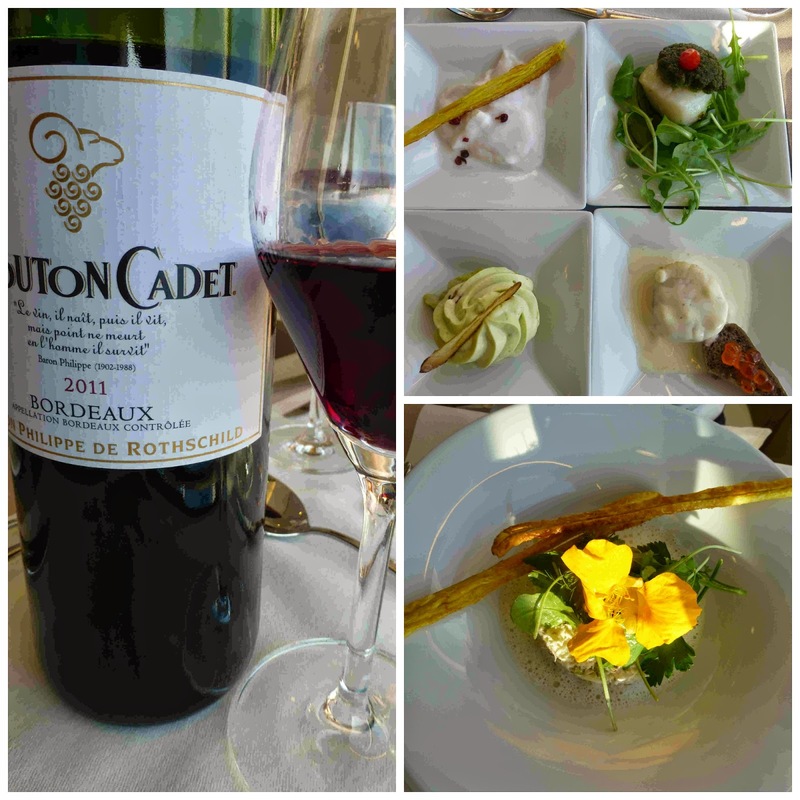 Splendid food and views! 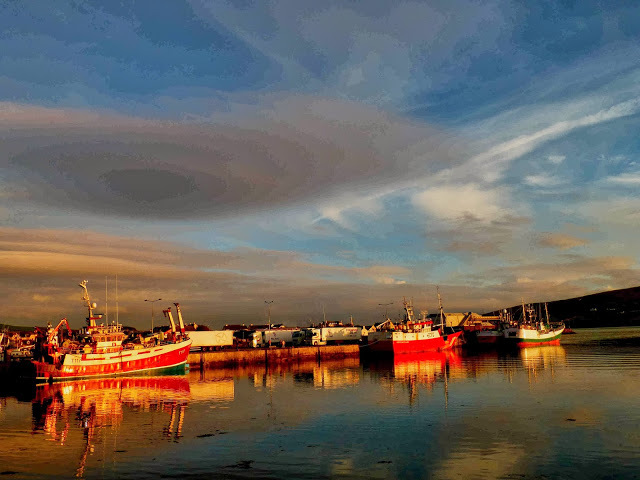 For harbour views, you'll find it hard to beat the sights as you come and go to Dingle’s Out of the Blue. And close by is the Boatyard. Fish will be on the menus of both for sure. Then again, there's a splendid view of Cork Harbour from the tea rooms at Camden Fort Meagher (below). 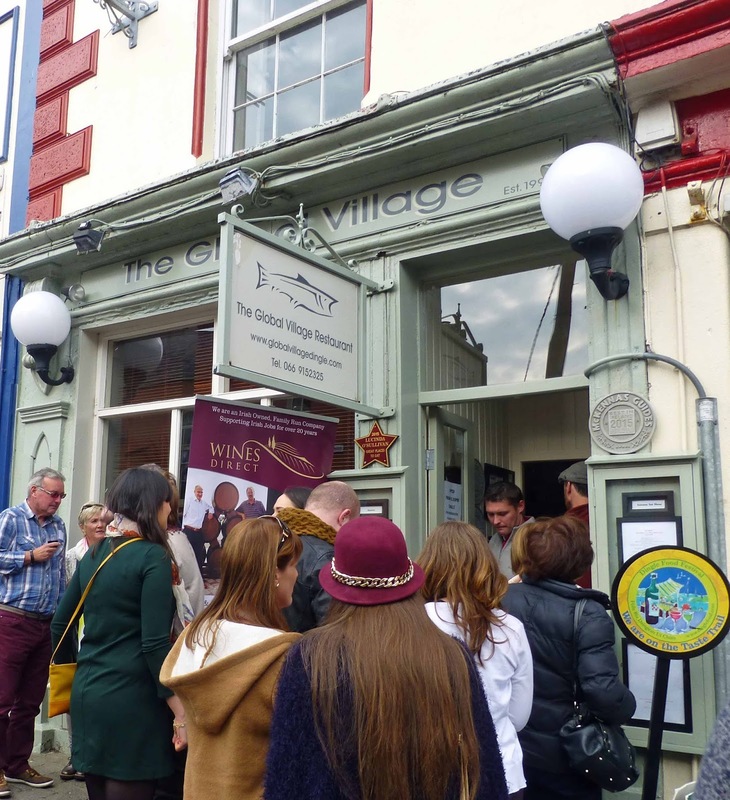 No shortage of seaside restaurants in Donegal. One of the best is the Seaview Tavern in Malin Head village even if the view to the sea is somewhat interrupted by the cars parking across the road. 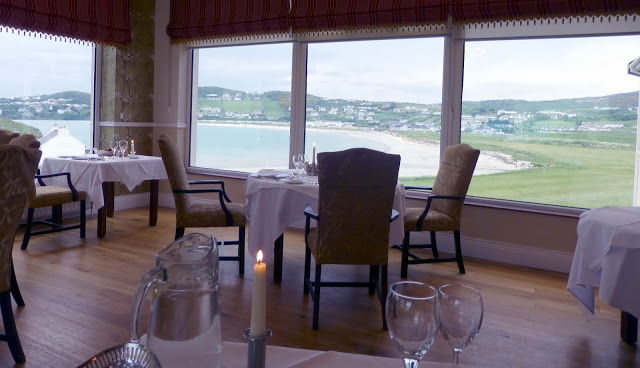 No such problems at the Rosapenna Golf Hotel, whose dining room overlooks Sheephaven Bay and the beach at Downies. 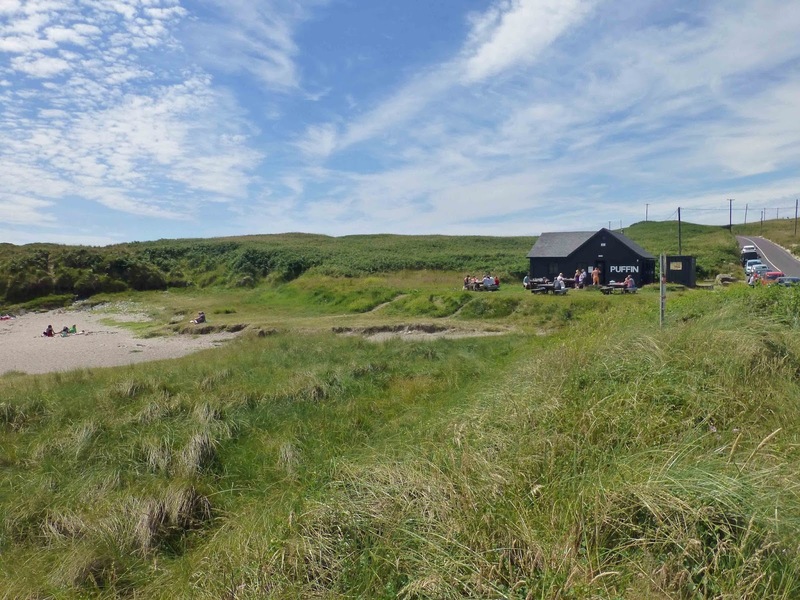 Further west, the bar at the Cove at Portnablagh, another top restaurant, overlooks a different part of the same bay. Perhaps the best ocean view is that enjoyed from your table in Bunnyconnellan’s, a very pleasant view and very enjoyable food here at this renowned Crosshaven (Cork) venue. 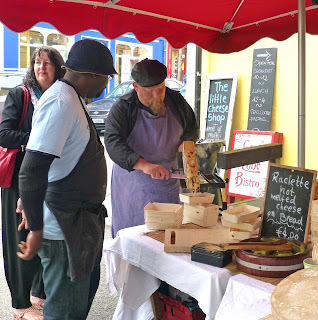 Back to West Cork and to Baltimore and Le Jolie Brise where I’ve sometimes enjoyed a dish of mussels as the day drew to a close with the island of Sherkin out in front. 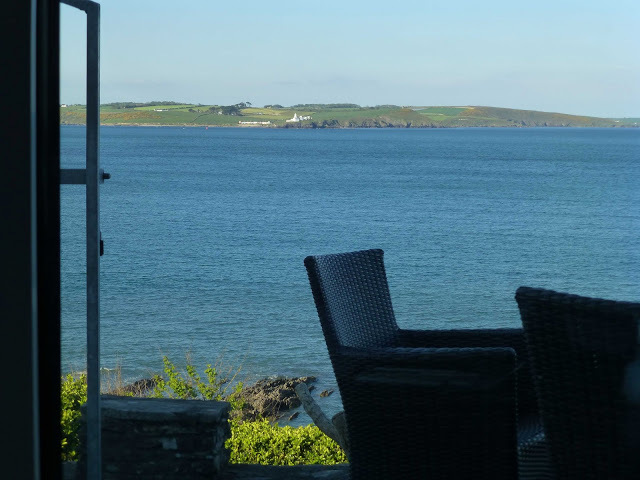 Speaking of Sherkin, the Islander's Rest sure has great water views! Hard to top that. 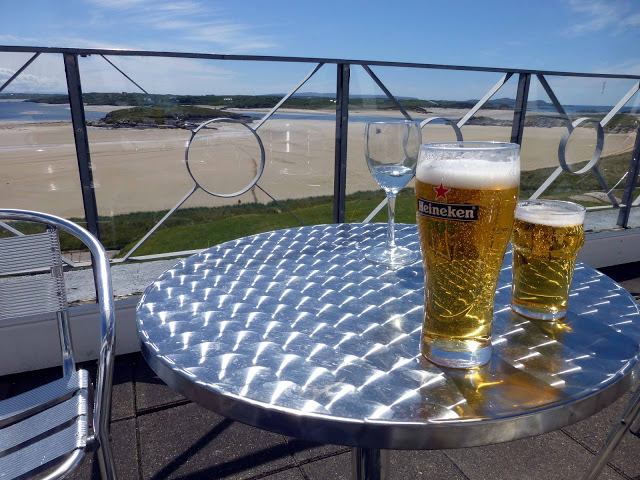 One view that comes close, maybe level, maybe even better, is from the Donegal restaurant of Ostan Gweedore where there is the most fantastic view over the beaches and the waters of the Atlantic. 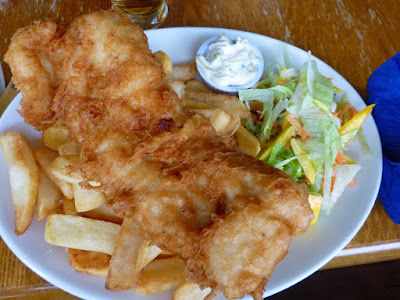 Perhaps you prefer river views. 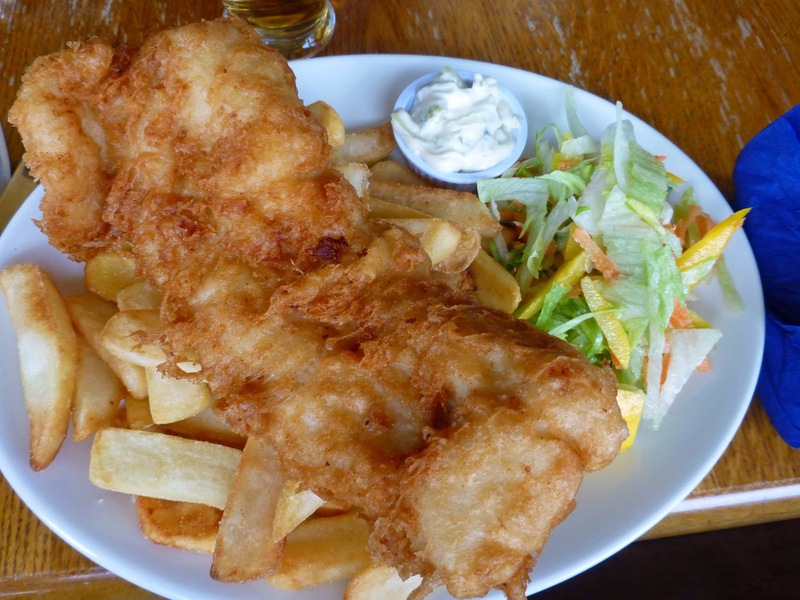 One of the best in Cork is from Electric, especially from the Fish Bar. 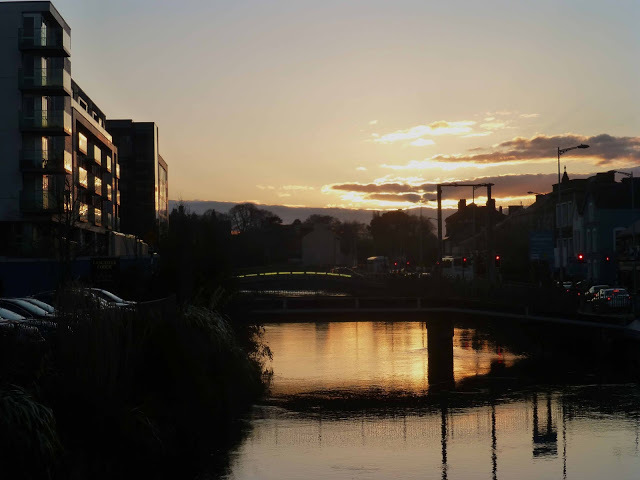 From the first floor of the South Mall building, you have fine views of the southern channel of Lee to the west and to the east. 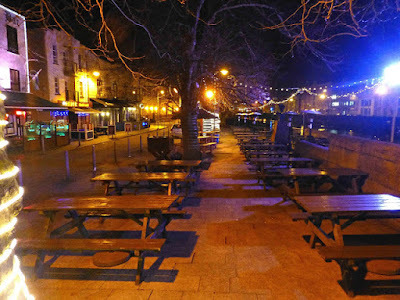 Also in the city, you hand almost dip your fingers in the Lee as you wine and dine at the Weir Rooms of the lovely River Lee Hotel. The Spinning Wheel, above the same River Lee, is at the very popular Griffin’s Garden Centre in rural Dripsey. Here you can enjoy some of Granny Griffin’s delights as you watch the water-skiers speed by down below. 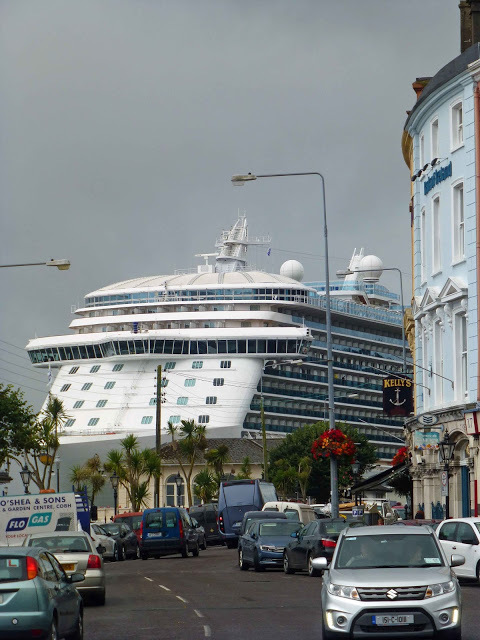 You have no shortage of harbour views in Cobh where you’ll find The Quays and The Titanic Bar & Grill. And you’ll also find pleasant estuary views not too far away at Murph’s in East Ferry. 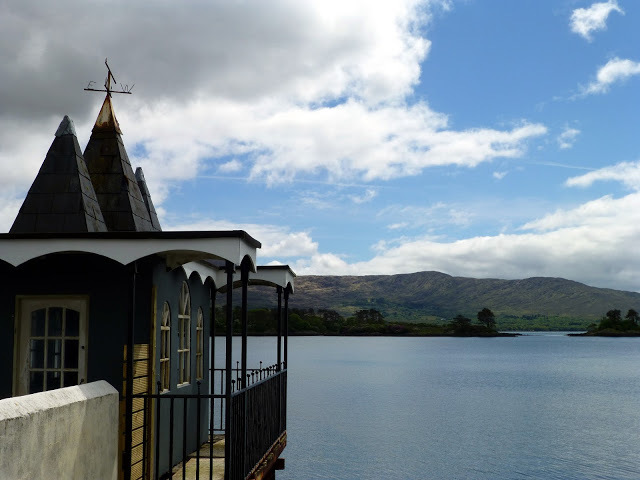 The Boathouse at Dromquinna, near Kenmare, is also well situated, right on the northern flank of the bay. And, in Limerick, the place to be is Locke Bar. The Puffin Cafe on Long Strand, Castlefreke, Co.. Cork, is my latest addition (09.07.17). It overlooks that long beach and the ocean.